<br>Set on the windy plains of Ensai and its surrounding provinces, Windchaser finds you in the ruins of a world destroyed by the war of the ancients a place where packs of wild beasts, bands of pirates, and powerful war machines torment the land and its survivors. This dangerous world has created a demand for professional fighters and adventurers,brave men and women organized as freelance guilds who offer their services to anyone ...who can pay their price.Take control of a mercenary guild whose hub and mode of transportation is a fantastical flying ship. As the game's story unfolds, you will follow a group of important characters and recruit new members to expand the possibilities and the power of your guild. The various characters joining the guild will earn experience and can be trained into several unique classes, giving you great variety in forming parties to suit different tasks or enemy formations. 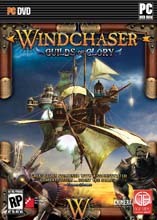 Windchaser is divided into missions linked through the storyline and accessible through a detailed world map.